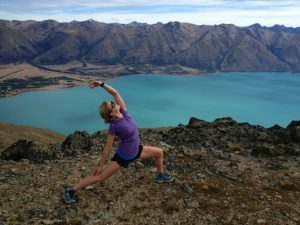 Welcomed with a rejuvenating fresh juice, you’ll meet the NZ Adventure Retreat team and receive your welcome pack with everything you’ll need for an epic 4 days of connection with nature, the self and others. 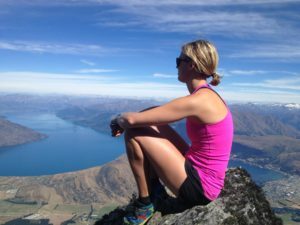 After getting acquainted, we set off for a late afternoon hike with mountain-top yoga to settle into our new surroundings, taking in the views of the majestic mountains towering over the township of Glenorchy, inhaling the freshest air and becoming one with nature. A wholesome and delicious in-house dinner follows as we return to our premium, fully eco-friendly home base. We later proceed into our first workshop where you uncover your core values and re-connect to the things that truly light you up. 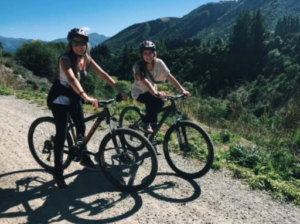 We start the day with a hearty breakfast and head out for a biking adventure on your choice of easy to intermediate trails, overlooking the jaw dropping Humboldt and Richardson mountain ranges. What better way to cool off then with a refreshing polar plunge in the crystal clear waters of the lake? With a packed lunch we enjoy an outdoor picnic amongst the native beech forest listening to the sounds of the local birdlife. We ease into the evening with a Yin Yoga practice to restore and stretch the muscles and follow with a wholesome meal to replenish and refuel the body for the next day of adventure. Starting the day with an Vinyasa Yoga class to awaken and mobilise the body. Today the choice is yours. Have you always wanted to ride a horse in the high country or through a river? Perhaps you’d prefer a canyoning adventure, a relaxing kayak on the lake, zip-lining through a beautiful forest and over pristine streams or a mindful mountain hike to take in the majestic views and fill your lungs with more of that fresh mountain air. Whichever activity you choose you will gain a great sense of accomplishment and a connection to nature. Late afternoon relaxation incorporates massages for those after some relaxation or sports massage therapy by our amazing and extremely experienced Sports Massage Therapist. Others will use this down time to chill-out and reflect with journaling. In the evening we get excited through creation of new and exciting goals and delve into what might be holding us back from being bold and courageous in this space. We end the session with clarity and an inspired motivation for what lies ahead. A tasty breakfast gets us started before we take our yoga practice to the lake with Stand Up Paddle Yoga. 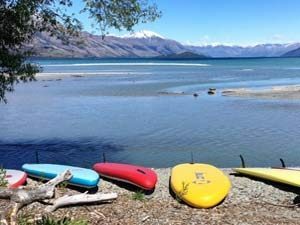 After a warm-up paddle along the crystal clear waters of Lake Wakatipu, we flow together on the lake watching the reflection of the surrounding mountains on the glassy water. We wrap up the afternoon together with a sit down lunch, sharing the highlights of our 4 days together. Before the farewells, you are set up with the tools to turn your goals and dreams into reality and the inspiration to keep you on track. You leave the retreat with a strong sense of wholeness, connected to your true values and set off marching to the beat of your own drum.